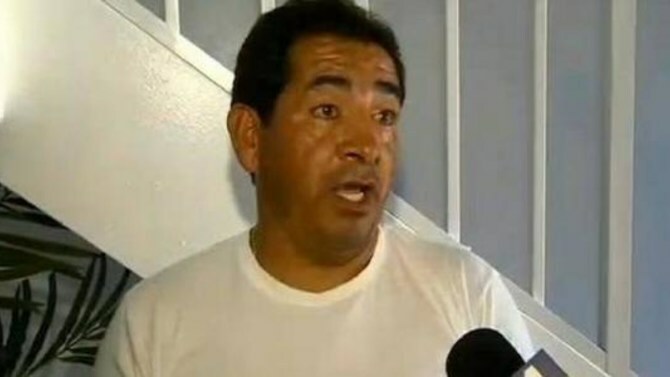 A Colombian immigrant has been heralded a hero after he saved a Miami police officer from a shootout. William Ramirez was on his way to work when he saw Officer Rosny Obas -- a rookie on the job for nine months -- taking cover from a man firing at him with an assault rifle. Ramirez took swift action, driving his minivan between the shooter and Obas before opening his side door for the officer to get in and driving him to safety. The trouble started when taxi driver Frantzy Armand became hostile while on the job, reports the Miami Herald. He reportedly got into an accident with another taxi that day, and went back to the other driver's company where he vandalized several cars. Obas was taking a report from the company the next morning when one of the workers saw Armand driving by, reports the Miami Herald. The officer then attempted to pull Armand over. But when Armand got out of his car, he fired at Obas with an assault rife through a duffel bag. A firefight ensued between the two men, with Obas trying to hold his own despite being outgunned. The battle turned in his favor, though, when Ramirez, a father of two, noticed the situation unfolding from a distance and drove his minivan between the two men, shielding Obas from gunfire. Obas then got in the van and the two sped off. They stopped eight blocks away where Ramirez gave Obas a drink from his water jug. The next morning, Ramirez received a phone call from Miami Mayor Tomas Regalado, who said that he wished to give him a plaque at the next commission meeting in honor of his heroic efforts. Things did not end as well for Armand. After Ramirez took Obas to safety, he took the officer's patrol car and attempted to flee the scene. He was soon stuck in traffic and began to fire his gun, hitting a nearby driver. The situation came to an end when Armand drove to a neighborhood where an off-duty police officer was present. The officer demanded that Armand lower his weapon, and when he refused, the officer opened fire, hitting Armand. Armand was taken to the hospital. Although the initial firefight between Armand and Obas ended with an injured bystander, the person is expected to make a full recovery. The driver hit when Armand opened fire in traffic is also expected to recover. Armand was charged with two counts of attempted murder and discharging a firearm in public. He was denied bail. Ramirez later met with Obas' police union attorney who thanked him for his actions. Police Chief Rodolfo Llanes is grateful a good Samaritan was there to help one of his own. "I've spoken to him and he's very proud of what he did, and we're very proud and thankful," the police chief said, reports WPLG. "Gratitude goes out to someone who helps an officer. He said it best: God put him there to save the officer's life and that's what he did." Ramirez is looking forward to being honored at the city commission meeting and is grateful for the country that he now calls home. “I love this country,” Ramirez said.